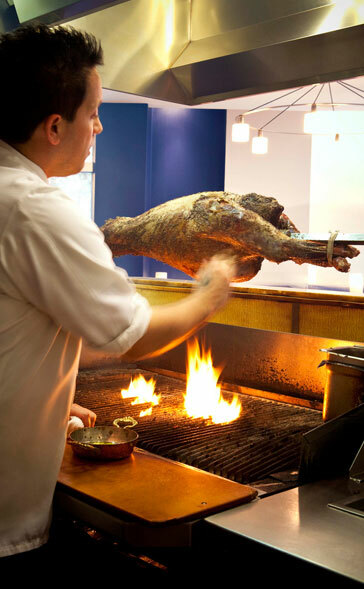 Chef Mike Isabella is roasting whole lamb for Zaytinya's Greek Easter festival, through April 17. The deal: For $7, grab some slices of spit-roasted lamb, fresh pita, tzatziki and pickled onions for lunch on Zaytinya's patio, through April 17. The deets: Chef Mike Isabella is spit-roasting lamb as part of Zaytinya's two-week Greek Easter Festival. The lamb lunch deal is available on the patio from noon to 2:30 p.m. weekdays through April 17. You can take it to-go or have a seat at tables on the patio. Offal fans will want to stay for a full meal — Metrocurean got to sample a few of Isabella's creations that are showcasing the whole lamb, including delicious squash blossoms stuffed with lamb sweetbreads and lamb heart mixed with bulgur, mint and yogurt. Also, look for Isabella this Sunday, April 11, at the Dupont Circle FreshFarm Market. At 11 a.m., the chef will be doing a cooking demo and offering up samples of Zaytinya's Easter specials. We just posted about this at http://iflipforfood.blogspot.com/! It was delicious (but MAYBE on the small side, for some). Oh Yumm! Thanks for the heads up about their lamb special. And so glad you liked the post, Christina. Always nice to hear the site is appreciated. Thanks for posting the info; I had the lamb for lunch three times while it was offered! A delightful and affordable alternative to the usual downtown sandwich fare (the restaurant probably made no money on it). JRM - That's so great that you got to take full advantage! I'm jealous.